Encounter: Whale sharks and Wobbegongs. 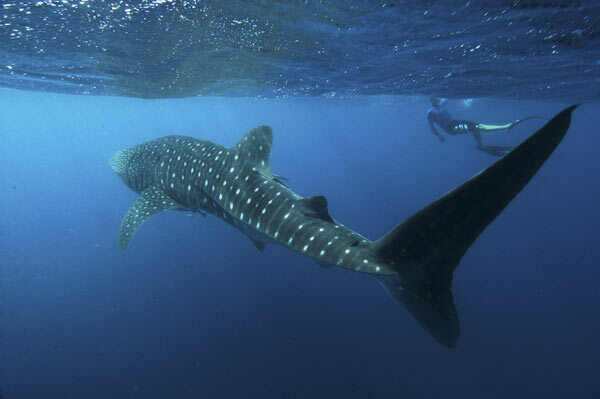 Whale shark encounters run from April till June. The sharks cruise along the offshore reef flats a few miles from shore. Spotter planes track the sharks movements and dive boats are given directions on where to head until they spot the sharks. Then, a spotter jumps in the water and swims after the shark which can be traveling at 2 or 3 knots, and groups of snorkellers are dropped in the path of the shark. The participants attempt to keep up with the traveling shark as long as possible until another group take over. The encounter continues until the shark dives or the snorkellers are too exhausted to continue jumping in. Keeping up with whale sharks in this scenario is not the easiest thing to do especially when pulling a large camera housing along for the ride. The rules of engagement include staying behind the pectoral fins of the shark and maintaining a distance of 4 meters from any part of its body. No flash photography is allowed. Tasseled wobbegong sharks are in residence all year along the northern reefs of Ningaloo. The best place to see them is the Navy Pier at Exmouth. As they tend to lie motionless it is easy to study them but as they generally squeeze into tight spots photography can be difficult. Even if the wobbies are not present on the pier, the diving there is exceptionally good for the area and should not be missed. 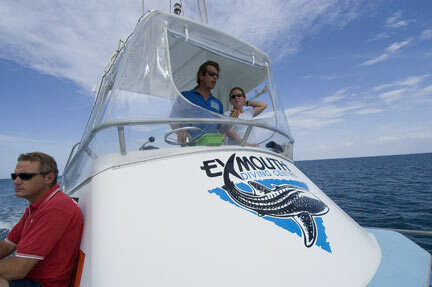 Operators: Exmouth Diving Centre among others can take you out to the area where the Whale sharks are seen. Their success rate in finding the sharks is generally very good with up to a dozen or more sharks being spotted from the plane on good days. 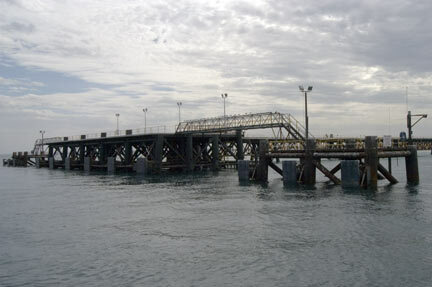 Exmouth Diving Centre also has the contract for the Navy Pier which means that they are the only company that is allowed to run charters there. Accommodation: Exmouth has a variety of accomodation choices including a number of hostels, a couple of hotels, and a campground. If you're thinking of camping consider the extreme temperatures in northern WA during the summer months. The Potshot Hotel has a variety of room types to suit most budgets, a back packers area, the only Pub in town, and Exmouth Diving Centre. Directions: Exmouth can be reached by over night bus from Perth or Broom or by air via Perth. Look at flight prices when buying a bus ticket as flights are often almost the same price as the bus.